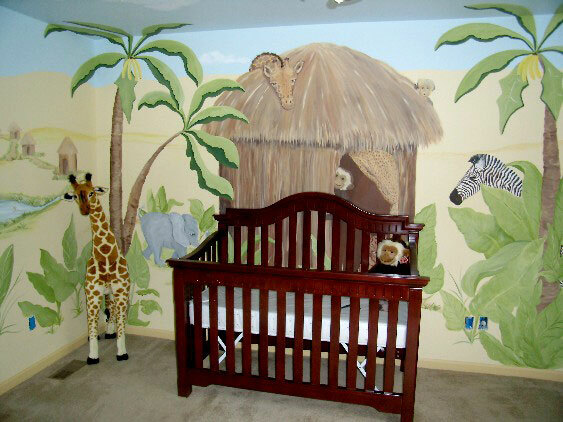 One of our joys as mural artists is meeting with prospective parents or those with newborns. 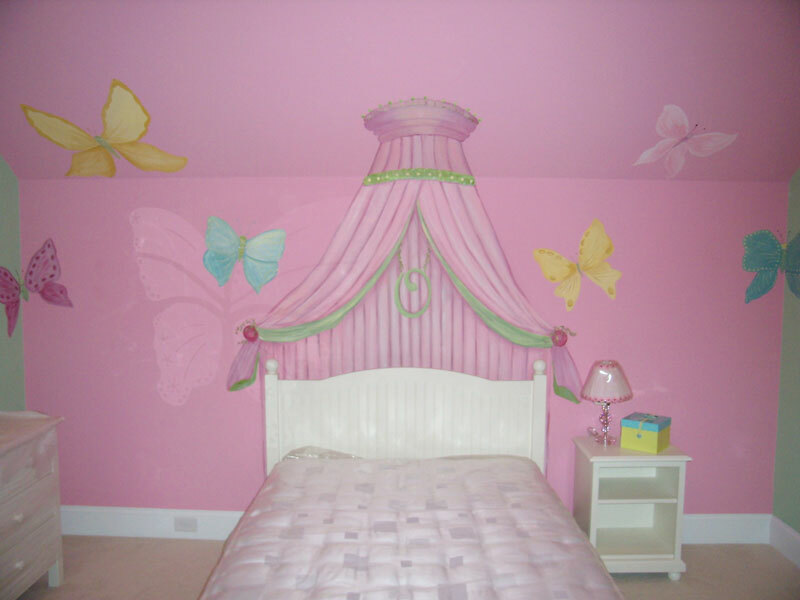 We can help create the perfect atmosphere your child will enjoy for years to come. 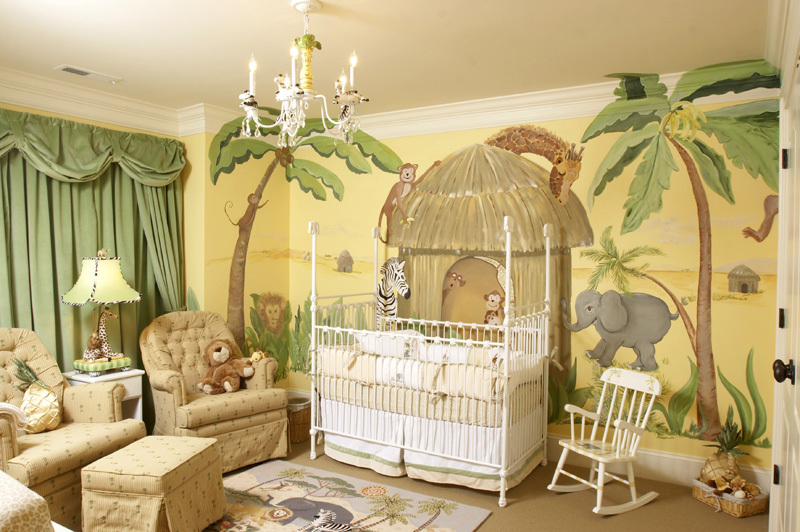 Choose a nursery mural theme from jungles to underwater worlds to special nursery rhymes, bows and racing cars. After an initial meeting to discuss themes, fabrics, patterns, colors and budgets, we go back to the studio to work up color sketches and estimated prices. At a second meeting these are presented to the client and alterations are made if necessary. 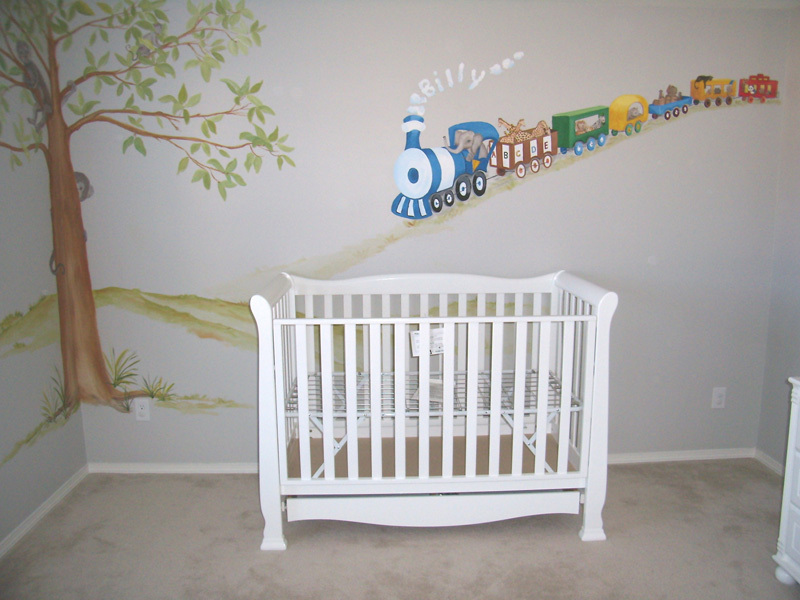 Explore some of our recent nursery murals below. 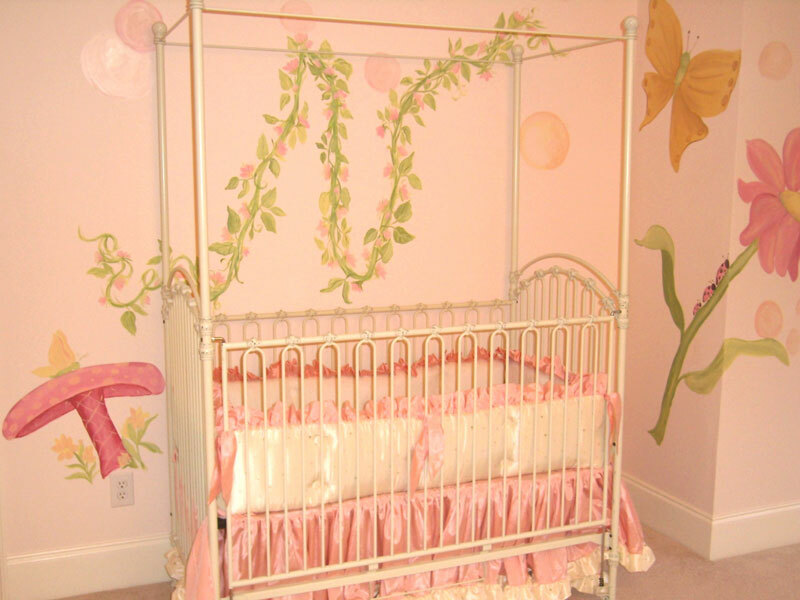 This nursery compliments the crib bedding and colors and brings out the beautiful blues, greens and lavendars in the bumper pad. The British Mom and "tar-heel" Dad knew they wanted a castle and frog to anchor the theme but were open for anything after that. Hot air balloons incorporating the British flag and the UNC logo fly around the room as the family dog looks up the tree at a squirrel and nesting birds. A border with a favorite verse of the Mother is hand lettered around the top of the room with decorative frogs on mushrooms interspersed. It's a jungle in this room!! The goal was to make the room a total experience upon entering. Trees and animals appear on all 4 walls with the palm trees extending onto the ceiling and wrapping around the corners. Playful monkeys peek out from the huts interior and, along with the other animals, keep a watchful eye on the baby in the crib. 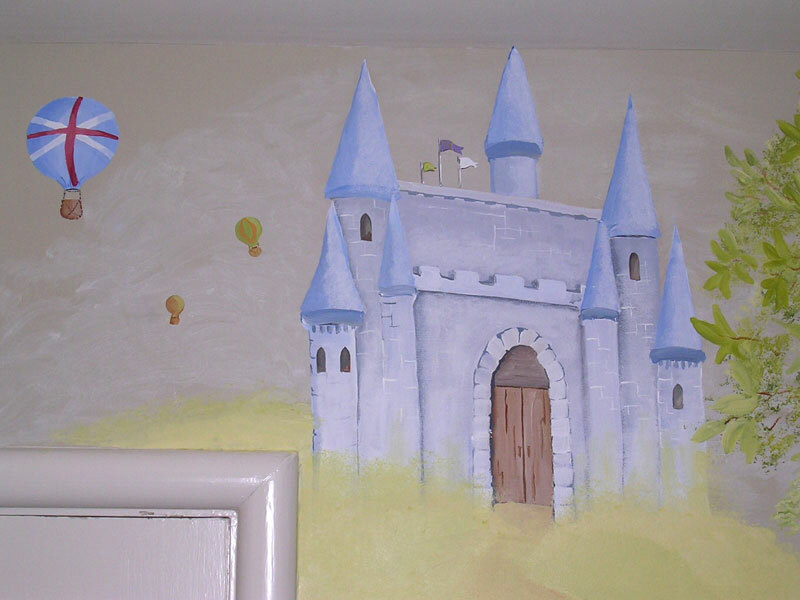 This mural can be used in sections for playrooms or bathrooms. 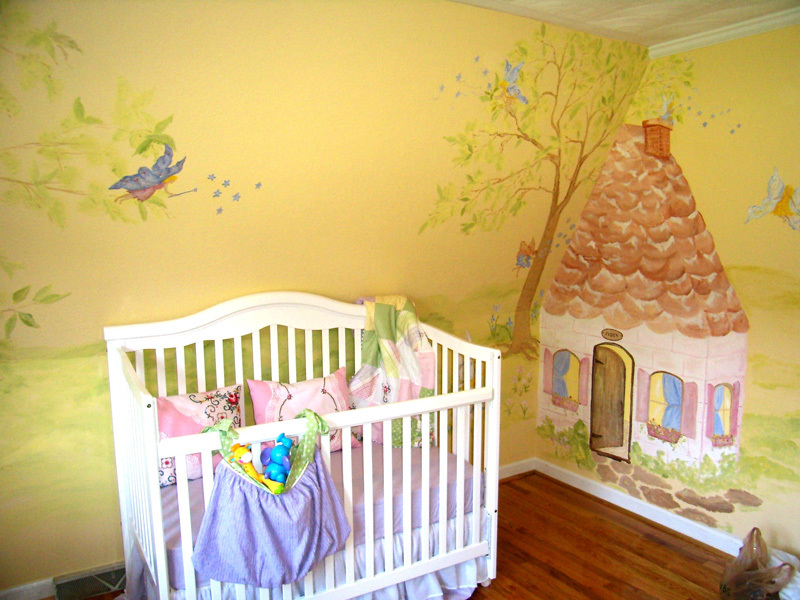 This family wanted something to compliment the striped nursery we did for their daughter several years ago. 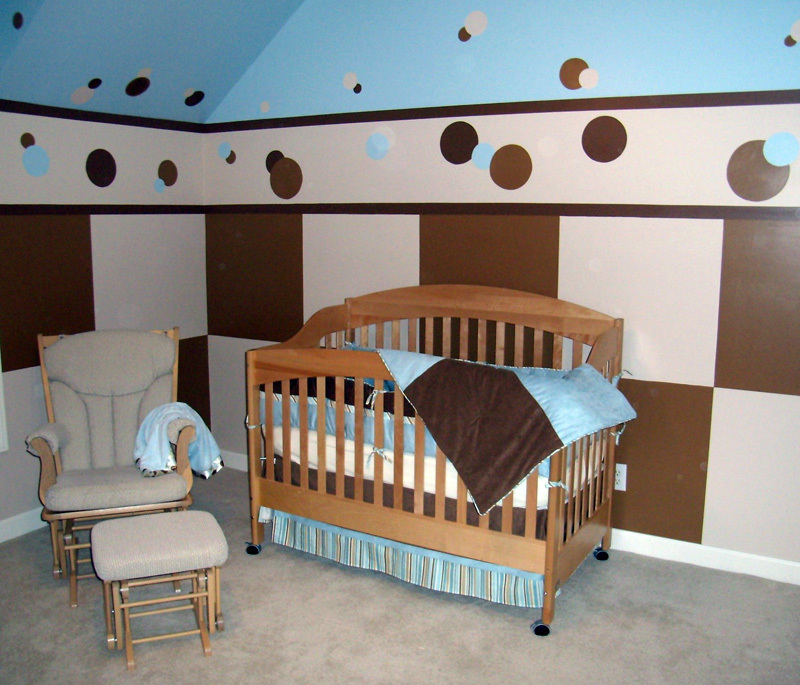 With a son on the way the decision was to go with a geometric pattern that would look good with the odd angled room. Here are bold squares and circles of two shades of brown and blue to match the bedding.